Sometimes a movie has no choice but to rely heavily, if not completely, on the merits of a particular performance. Without that performance, the movie loses its central focus, or becomes less of an accomplished piece, or worst of all, lacks any appreciable impact. 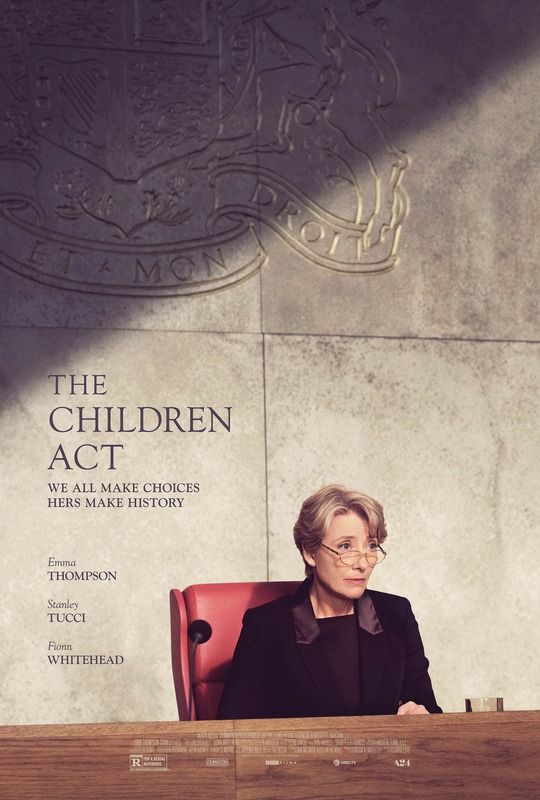 Such is the case with The Children Act, an adaptation of Ian McEwan’s 2014 novel, and with a screenplay by McEwan himself. Without Emma Thompson, this would be a hollow movie with little to recommend it (though that’s not to say that another actress couldn’t have carried off the role to the same degree). What comes across, and very early on, is that Fiona is the whole show, and without her the storyline and the movie as a whole would amount to very little indeed. McEwan is a terrific novelist, but he’s not necessarily a terrific screenwriter, because in translating his novel to the big screen, he’s forgotten to make the elements around Fiona as interesting or intriguing as those that directly concern her. This leaves the movie dependent entirely on Thompson’s performance throughout, and in the process, relegates everyone else to the second tier. The decision Fiona makes in regard to Adam’s case won’t surprise anyone, but once she makes it, the movie jettisons its legal drama set up and becomes something entirely expected and dramatically demoralising: Fiona finds herself “pursued” by an overly enamoured Adam. Up until now, the story has played out with a keen awareness of the legal, religious and emotional undercurrents of Adam’s case – in the witness box, Adam’s father (Chaplin) is a passionate advocate for his faith in God – but with the verdict in and Adam’s life saved, it becomes an unwieldy drama of misspent longing and unwanted attention that turns Adam from a fierce proponent of religious and personal choice into a drippy, Yeats-quoting stalker whose intelligence and wit seems to have been drained out of him along with his own blood. This sudden change hurts the movie tremendously, and makes the final half an hour something of a struggle in terms of credibility. At the same time, the sub-plot with Jack is allowed to resolve itself with a minimum of effort. With so much initial momentum overturned, it’s again thanks to Thompson’s subtle yet deeply emotive portrayal that the viewer is able to carry on until the end, but with the certain (and unavoidable) awareness that, whatever the outcome, it won’t be as insightful or impactful as what happens before Fiona reveals her decision. Rating: 7/10 – Thompson’s magnificent performance is the real deal here, and the only deal as well, making The Children Act something of a lop-sided endeavour that’s compelling when focused on Fiona’s emotional confusion, but merely adequate at all other times; Eyre’s direction is solid, but Tucci is wasted in a thankless role, and the whole thing unfolds against a backdrop of repressed emotions that the script seems uninterested in revealing.